When I am in a .java file the unused code is usually grayed out or has a green underline saying this code will probably (probably because of some weird JNI/Reflection corner cases) be unused. But I have this project with thousands of Java files and I want to find ALL INSTANCES of such probable-unused codes. How can I do that in IntelliJ IDEA? Just use Analyze | Inspect Code with appropriate inspection enabled (Unused declaration under Declaration redundancy group). 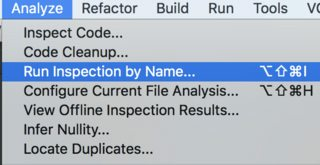 Using IntelliJ 11 CE you can now "Analyze | Run Inspection by Name ... | Unused declaration"
Not the answer you're looking for? Browse other questions tagged java refactoring intellij-idea code-metrics code-inspection or ask your own question. How find all unused classes in Intellij Idea? How to find unused constants in PhpStorm? How to use IntelliJ IDEA to find all unused action script classes? Are there any code analyzers that will help find unused code?